It’s funny how plastic memory is. What I mean is that we can never be sure that our memories are not just as constructed as the meanings we extract from them. And what I mean by that is that I hope you take this reconstruction of how we began our connected learning MOOC (CLMOOC) as a best effort to show you how we messed about in the beginning. Maybe you will take what you will from this story to create your own CLMOOC, but beware, as always, YMMV. A way to engage those people and values that fits. Hidden in this ‘abc’ cluster is a transformative universe that has more to do with attitude than aptitude, more to do with having a worthy ‘score’ to play from than a set of commandments, and more to do with having an ‘open enough’ space to work within than having a perfect platform. I could start and finish this essay just by rolling the credits now and telling the story of how each person contributed to the success of the CLMOOC this past summer. It would be an annotated bibliography that might partly reflect my belief that the wellspring of that success begins and ends with people connecting and acting together. I think activist Myles Horton put this credo best, “There is no method to learn. Trust people and believe in their ability to think for themselves.” The usual heroes know who they are so I will dispense with the credits. The CLMOOC began before it began. It emerged from Connected Educator Month, August 2012. Many of the principals who organized CLMOOC met and played together during that very yeasty month. Happily (I almost said ‘luckily), the National Writing Project (NWP) was able to gather that energy together under the auspices of research done by Mimi Ito and under funding provided by the MacArthur Foundation to bring some of these good folks together. Paul Oh and Christina Cantrill gathered a team of facilitators and a support staff to create a MOOC based upon those connected learning values and principles. Let me backtrack a bit here. There was already an underlying core of experience among the facilitators and staff–they had all been and were active K-University teachers and they all had gone through the NWP’s local Writing Projects. Everyone had already bought into a set of values instilled in those Writing Projects whose motto is ‘teachers teaching teachers’. I think part of the success of the CLMOOC comes from this potent value system that was already internalized and sync’ed with the connected learning values we were trying to share and teach over the eight weeks of the CLMOOC this summer. You might say we were more than halfway home with a set of values before we even layered those of connected learning atop them. But I don’t think that accounts for its ultimate success. I think that there is an even greater mondo-value, a value under these other values, one that puts learners at the center. And by putting learners at the center we also put the relationships between and among learners at the center. Good folks without direction are just as lost as anyone else. For us, not only did we come already ‘baked in’ with a set of values (love of edtech, the Writing Project, constructivist learner-centric paradigm) but we were motivated by the need to share a new, research-based set of values and principles. In this case we were out to background the connectivist learning principles and values demonstrated in the work of Mimi Ito and company. That was our remit and that was how we avoided ‘confusion’. you find the signal whatever that might be. The signal is not something particular as far as I can tell. It is not a mission statement. It is not just a set of shared values and principles. In hindsight I can see that we succeeded not just because we were dancing to the same tune, but we were constructing shared meaning and getting tuned to the same harmonic. At some point the dance overwhelmed the design before we even began the CLMOOC. Yes, we had weekly plans. We made a conscious decision about what to do each week before we even began. We struggled with the design elements together. There was a mix of harmony and dissonance. For example, one of our facilitators, Karen Fasimpaur, was adamant about having a way to gather together into a bank what we came to call “makes’. Makes are a simple set of directions for creating and doing. For example, we had a ‘toy hack’ that involved taking an existing ‘toy’ and transforming it through serious play into something else. So we stole ds106’s idea, figured out a way to hack up a ‘make bank’ and together with Karen we made her idea happen. I am certain some of us thought that this was a lot of work for a little result, but in the end it was proof of some of the principles and values we were not only trying to teach, but to internalize as well. Out of the noise came a strong signal and a mental model that valued equity, full participation, and social connection. Not a little result. HOMAGO is an acronym coined by Mimi Ito-“hanging out, messing around, and geeking out”. It accurately describes the ecosystem we created before we even began the CLMOOC. There were several niches within that community that overlapped just like they do in a natural ecosystem. We had a blog space, a twitter space, an online live space, a newsletter space, and a social space. These all nested within the digital space of the Net and they crossed boundaries inside that space. It was a gestalt made out of ‘small pieces loosely joined’. I can’t help but think of the river in The Wind in the Willows when I consider the space we made together. 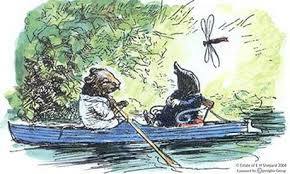 When Ratty and Mole meet on the river, Mole gets into a boat for the first time. 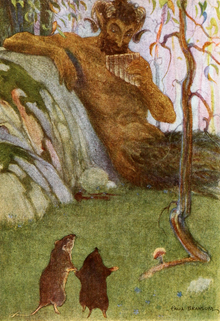 “Is it so nice as all that?” asked the Mole shyly, though he was quite prepared to believe it as he leant back in his seat and surveyed the cushions, the oars, the rowlocks, and all the fascinating fittings, and felt the boat sway lightly under him. Only now, do I realize that everyone picked up on a deeper, simpler melody lurking beneath. And that melody was the idea of play. What Kevin and I modeled was that it was perfectly alright, even expected, to make your own way with your own play. This idea of serious play did not rise solely from us, it rose from hanging out and geeking out on those mornings together. It came from messing about on the river with everyone in our Hangouts-on-Air else before we pushed off from the bank into the current. Like the river, our CLMOOC may have had headwaters, but its source is, like the zeitgeist, everywhere and nowhere. And this isn’t to say that I have made our work here more legible or even that I even wanted to or believed I could. By ‘legible’ I am referring to a term out of its usual context. James Scott in his incredible work Seeing Like a State develops the term and its counterpart, illegibility. 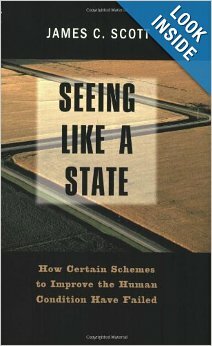 He argues that reality is legible if it is obviously constructed, an externalized model from a human source. Think blueprint into building. Illegibility, on the other hand, arises from complexity. One of the examples Scott uses is city planning. Cities are the continuing result of a collectively externalized mental model derived from countless citizens over centuries. City planning failure results when planners view this illegibility as chaos not complexity and then try to replace that chaos with rational (and relatively impoverished) constructions. I am trying not make our CLMOOC legible by laying out a set of instructions. Rather I am trying to give you a sense of tempo, what Venkatesh Rao, in his book Tempo, calls the gestalt of its reality, its momentum, energy, and rhythm. I have been trying to give you a feel for the creative and transformative power of CLMOOC, but not a legible blueprint for creating your own. Or, to use the metaphor of the millpond, I am trying to show you the pond that powers that mill but not exactly how we dammed it up. I am not particularly interested in telling the latter story not because I don’t want to but because it is so complex as to be illegible. I would do it a disservice, I would kill it by dissection, I might love it to death. CLMOOC, the digitally real environment that is the subject of this essay. Muck about and see what works and what doesn’t for you. Look at the flows within the various parts of the CLMOOC experience (Google + Community, Hangouts, Twitter Chats, blogs) and then explore the various concentric rippling flows in and out of the field. If you still want to make your own MOOC after that, start with people of good will. Figure out who you are together. Decide what is important. Set a schedule. Create workflow and routine to create together. Move slowly, but don’t stop. Eventually, what will emerge is a governing aesthetic that includes the good folk, the good values and the good spaces you feel that you need to succeed with your own MOOC project. You will then have your own orchestra, your own players, and your own music that fits. Not someone else’s. Yes, let us start at once. And begin again and go agley and again and agley, homo ludens, folk at play.